Two pink Royal Lace 5" Berry Bowls, both in very nice if not quite perfect condition. One has a TINY flea bite on the outer edge, the other has a little bit of minor stacking roughness on the inner edge. No other damage or defects. 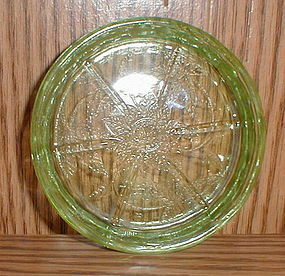 Floral/Poinsettia green Coasters in excellent condition with no damage. Three ave available. $12 for one or $25 for all three. 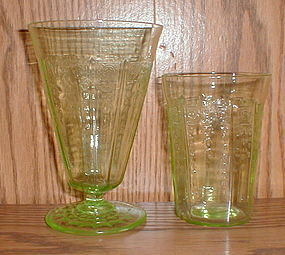 Green Princess Tumblers 4" & 5 1/4"
Green Princess tumblers in excellent condition with no damage. Two 4" ($20 each) and one 5 1/4" footed ($25). $50 if all three purchased together. Three Adam footed Sherbets, all in excellent condition with no damage. $30 for one or $25 EACH for 2 or 3. Windsor green Footed Sherbets, all in excellent condition with no damage. Six are available. $12.00 for one or $20.00 for two. 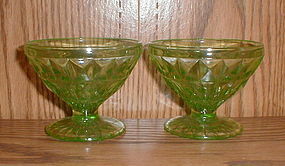 Two Patrician footed Sherbets, both in excellent condition with no damage. 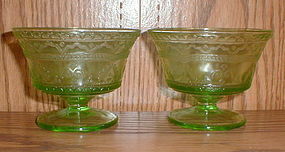 Florentine #1, green, Cups & Saucers, all in excellent condition with no damage. Four Cups and two Saucers are available. $10 for one cup & saucer. $7 each for individual cups. 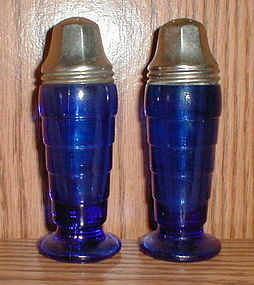 Moderntone cobalt Salt & Pepper Shakers in excellent condition. No damage to the glass. Lids are original and show a little age, but are still in decent condition. 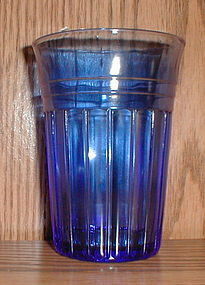 Three cobalt Aurora Cups, all in excellent condition with no damage or use marks. $10 for one or all three for $25.00. Three, Hazel Atlas, New Century 3 1/2", 5 oz. Tumblers, all in excellent condition with no damage. 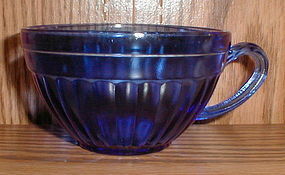 Six, UltraMarine, Swirl 5 1/4" Berry Bowls, all in excellent condition with no damage or use wear. $ 12 for one or $10 each for multiple purchases. Two delphite Swirl Cups & Saucers, all in excellent condition with no damage. Tipp City, "The Herb Chest" 5 blue lid Shaker Set. Shakers, decals and lids are all in excellent/mint condition. Savory, Thyme, Poultry Seasoning, Marjoram & Bay Leaves. $115.00 for the 5 shaker set. A "Sage" shaker is also available individually, but the lid is a bit dull and not as nice as the lids in the 5 shaker set. $20.00 for this one. Tipp City "Black Leaf" 7 Shaker Set. Cinnamon, Paprika, Mustard, Nutmeg, Ginger, Allspice and Cloves. Shakers and decals are in excellent condition, Original lids show a bit of wear, but are still nice. $110.00 for the set. Individual (not pictured) Cinnamon, Cloves, Nutmeg and Ginger are available, all excellent except for some wear on the lids. $15.00 for one or 2 for $15 for the individual shakers. 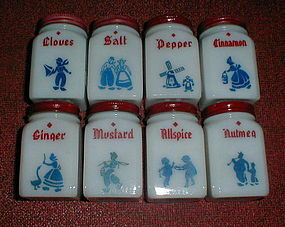 Dutch theme 8 Shaker Set. 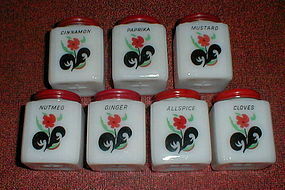 Cloves, Salt, Pepper, Cinnamon, Ginger, Mustard, Allspice and Nutmeg. Shakers and decals are excellent. Lids show wear, but are still ok. $75.00 for the set of 8. 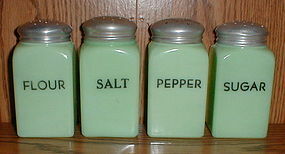 Individual Cloves, Pepper and Cinnamon are available (not pictured). $10 for one or $30 for all three of the individuals. Set of 10 shakers with the Black Scroll design. All are in excellent condition with no damage. Lids are original and show a little wear with a couple minor dents but are still very good. $110.00 for the set. 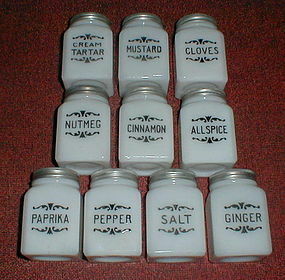 Duplicates are available for all except Nutmeg and Cream of Tartar. Duplicates are for sale individually at $10 for one or two for $15. 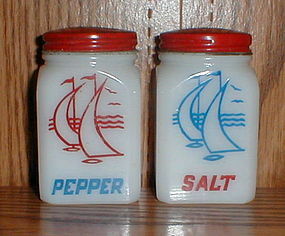 "Sailboats" Salt & Pepper Shakers, glass and decals in good condition. Lids are original and do show some wear but are still ok.